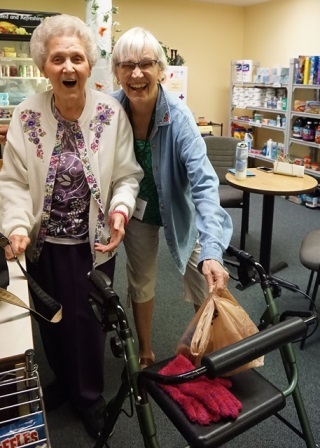 Clement Manor depends on the caring spirit of volunteer helpers. Even an hour or two of your time will help to enrich the lives of residents and their families. Corporate teams, youth, student groups, community organizations and families - all are welcome! The satisfaction that comes from helping those in need and making a difference! According to the Corporation for National & Community Service, there is research that indicates volunteering provides individual health benefits in addition to social ones. This research, in a report titled “The Health Benefits of Volunteering: A Review of Recent Research,” has established a strong relationship between volunteering and health: those who volunteer have lower mortality rates, greater functional ability, and lower rates of depression later in life than those who do not volunteer. Comparisons of the health benefits of volunteering for different age groups have also shown that older volunteers are the most likely to receive greater benefits from volunteering, whether because they are more likely to face higher incidence of illness or because volunteering provides them with physical and social activity and a sense of purpose at a time when their social roles are changing. Some of these findings also indicate that volunteers who devote a “considerable” amount of time to volunteer activities (about 100 hours per year) are most likely to exhibit positive health outcomes. Special projects can be coordinated to meet your group needs - let us know! Fun, new opportunities arise daily! For more information, contact Emma at (414)-546-7386.